Newly added “WaykiChain Milestones”, “Team Culture”, and “Alert” sections. Completed 70% of @ version, and optimized game performance and data sheet. Tested economic system, growth system, and game rules. Optimize special effects and user experience interaction. Optimized WaykiChain official website: added SEO, Milestones, Team Culture, and all contents can be edited and updated in background. Collected the bugs and users’ suggestions of WaykiBet, and updated the app according those useful suggestions. At the same time, the team began to write deployment automation scripts and instruction files of WaykiBet background, and provided the corresponding source code and installation package to open source community or third-party for secondary development and deployment. The first WeChat group of WaykiChain developer community had gathered 134 members, and the team continued to provide technical training to the members. By collecting feedback from the community, the blockchain explorer had been further optimized; Fixed the following problems: The account list update is missing; The transaction details are sorted abnormally; The balance is not synchronized. Promoted developer cooperation programs in channels such as Jinse, BiShiJie, WaykiTimes, and WaykiChain Wechat official account. The testing and operating team began to build an interface automation test system based on Jenkins, Git, Jmeter, and Docker. The primary goal is to test the system and interface of WaykiChain to ensure its security and robustness. Optimized the interactive content format of the client calling interface JSON-RPC, and corrected the spelling errors of help pages and code naming. Optimized the concurrent call processing performance of JSON RPC method getblockcount. Optimized the stability of the random disturbance of the block generation time. Fixed a crash bug in processing getblock messages due to data access errors from local hard disk. Fixed the reading order problem of hash parameter when Lua virtual machine handles the ExGetBlockHashFunc. Initiated the safety review of the public chain and smart contracts, including the scope of review, the standards and the selection of technology partners. Provided support to Russian exchange p2pcoinex for Waykichain wallet node deployment and corresponding technology support. Built WaykiChain wallet node service and provided technology support for CloudWallet, a cryptocurrency wallet service provider. Successfully held “WaykiChain Mascot Naming Contest”, “#WaykiXmas Sharing”, and WaykiChain Project One-Year Anniversary Activities, including 3 creative activities in different SNS platforms. One of the activities, “WaykiBet FOMO Contest”, had attracted 353 people to join in. Officially awarded the title “WaykiChain Global Partner” to our two community volunteers. One of the most famous crypto media — Hackermoon, published in-depth review for WaykiChain, and called WaykiChain backbone infrastructure for blockchain 3.0; WaykiChain project overview: “Wayki: Chain for Game Developers and Prediction Gamers.” was published on Steemit. WaykiChain project operation team held a live broadcast themed “1 Day in WaykiChain” in community with the theme “How Do We Run A Million-Level Community”, sharing WaykiChain team, office, souvenirs, daily work, etc,. Added WaykiChain’s Reddit, Steemit, and Medium link on CoinMarketCap, which means that the updates of WaykiChain project can be delivered to users from all over the world in a more professional and effective way. The global marketing team had achieved cooperation intentions with the world’s leading news organizations, professional cryptocurrency news platform and senior blockchain KOL. In 2019, more professional channels will be used to deliver more high-quality project updates to global users. Updated 25 issues of WaykiChain Daily News to the issue 100th. From issue 101st, WaykiChain Daily News will be upgraded to voice broadcast. Opened section in Tencent Cloud, specializing in sharing WaykiChain blockchain, smart contract and other technical topics. WaykiBet launched on Beestore, Biyongbao and IMAPP. Published questions and interactions on Xueqiu. Followed up on T2D2 program, built WPS cloud disk and developer community Q&A. Entered Songguo Finance, BTCEAC, and Feixiaohao (new verison). WaykiChain community & Huobi co-held a “Like” activity in Huobi project center. Held “WaykiChain Prediction — UEFA Champions League” activity with 888 WICC bonus. Held “WaykiChain Prediction — C.Ronaldo” activity with 138 WICC bonus. Held “Warm Christmas” activity, sharing wishes to win WICC. Welcome feedback from the community, so please do get in touch. Want to dive in further? 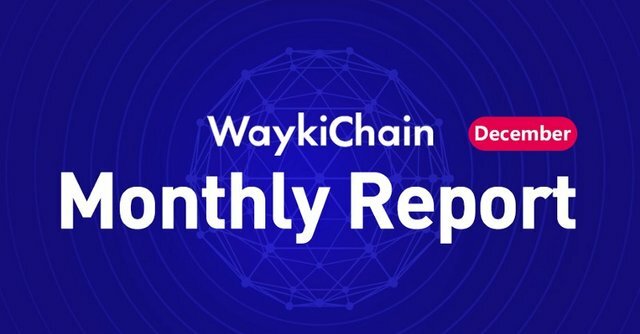 Follow WaykiChain on Telegram, Twitter, Reddit and LinkedIn.